Cottage/studio style, newly renovated with granite countertops, granite shower enclosure, beautiful wood floors overlooking the ocean. Wake up to the fishing boats, lobster and scallop boats leaving the shore. Relax and unwind. Top of the line sleeper sofa with press of a button blow up mattress. beautiful granite countertop and glass shower stall, toilet is top of the line with a self closing lid. Two of us stayed at this lovely one room cottage during our visit to Bowdoin. Although it is a very small space indeed, the kitchen and bathroom are modern and spacious and even the blow up mattress in the pull out couch was surprisingly more comfortable than expected. This place is all about the views, which are breathtaking. There is some construction work next door, but none was happening during our weekend stay, so it was very quiet. We had our morning coffee on the deck and enjoyed listening to the waves crashing at our feet. had an amazing vacation at the cottage. was right on the water with sunrise views. the cottage was well appointed with amenities, supplies,etc. only had to purchase groceries. Maine supplied absolutely gorgeous weather. If there were negatives they were only minor-mold on the large window curtains, minor musty smell that often does accompany waterside dwellings, otherwise it was outstanding-perfect for my needs. Amy was superb in addressing and resolving some access issues I initially had-overall a 5 star accommodation. This sweet cottage has full panoramic water views. It is well appointed and has everything you need. From the fire pit, to the hammock, to the bistro table, we lived in total peace and harmony for 48 hours. Watching the lobster boats every morning and the sunset sailboats at night was heavenly. We can't wait to return. Beautiful and comfortable. Sunrises are majestic! Beautiful, cozy cottage with great views! Great, quiet location! 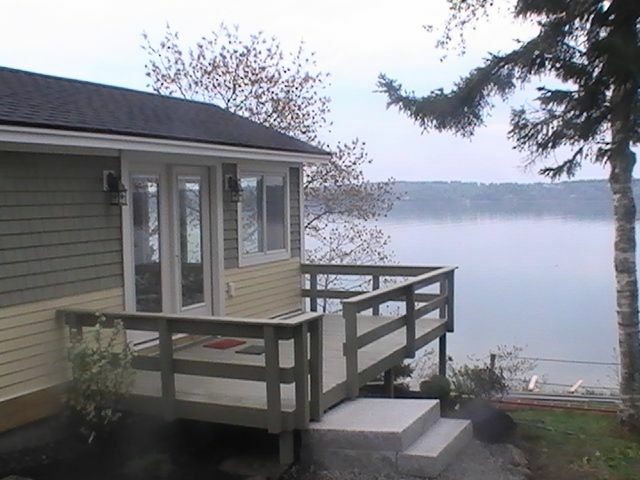 Wonderful views, right on the water, shared dock. Amy and Dan were wonderful to work with! Cottage is adorable and totally updated. It was very well stocked with just about anything you would need. The property even has a great burn pit and firewood. The only downside for us was the pull-out, blow-up bed. Otherwise it would be a 5 star! 95 Clark Shore is on the water, quiet street with only 2 other homes past ours. Plenty of parking. Kayak rentals available. Fire pit, hammock and plenty of ducks and lobster boats going by. Close to downtown Brunswick and a dog friendly beach nearby.